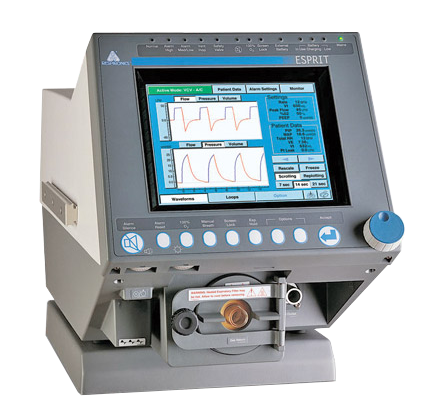 Save up to 80% on pre-owned Respironics Esprit ventilators. The flexible design of the Esprit Ventilator makes it easy-to-use and extremely portable for a clinical unit. This microprocessor driven unit offers a range of modes and breath types including volume control, pressure control, and fully integrated noninvasive ventilation. It has no need for wall air or compressors, and can be run on either ac power, a battery pack or an external battery. Ideal for use in any setting, from hospital to sub-acute care facilities. No need for wall air or compressor - free to move while in use!